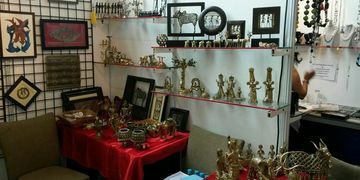 Truly Tribal is a rich repertoire of Indian traditional items and your one stop Tribal Art Gallery for availing the finest variety of handcrafted Indian & ethnic collections of myriad tribal & folk-art forms from across India. We are working with 100+ tribal & Folk artisans in more then 15+ traditional India art forms across India, with many award winning artisans leading the teams. We bring forth inspiring handcrafted artistic solutions for Home décor, Corporate & Social Gifting, Custom Interior Solutions etc. Our range is available in the form of Canvas/Paper Painting, Metal Curios, Wall Frames, Home Utility items and more.